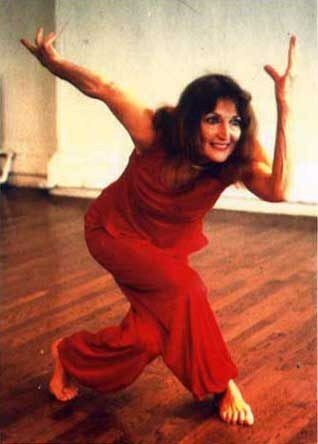 Dancer/choreographer, writer/painter, philosopher/nurturer, generous provider of space to Movement Research, Frances Alenikoff died on June 23. 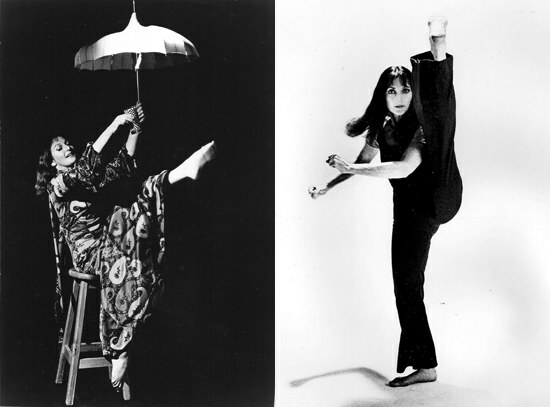 She created over 90 dance theater works and participated in projects with poets, musicians, filmmakers, and visual artists. She performed widely in New York, toured nationally and internationally, and taught workshops at universities. In 1964 she choreographed The Josephine Baker Show on Broadway. Alenikoff had a distinctive way of moving—slippery, impulsive, erratic—that came from years of improvisation and vocal experimentation. She could be brazen while dancing: She would lick her own fingers, then break up into a friendly cackle. She was a sorceress onstage. During the 1940s, Alenikoff studied at the Katherine Dunham School in midtown Manhattan. She also knew Doris Humphrey and Anna Sokolow during that period. In 1965 she was a founding member of Dance Theater Workshop and performed her mixed-media works in the little loft on 20th Street. Starting in the mid-90s she paired up with postmodern dancer/choreographer/philosopher Kenneth King. They collaborated on an richly fertile duet that projected a unique relationship between a man and woman: not lovers, not mother and son, not artist and muse, but something else entirely. It was a kind of Dionysian/Apollonian pairing of opposites that threw off sparks of wit, poetry, and belly laughs. Kenneth King’s wonderful essay about his partner can be accessed by going to the Movement Research Performance Journal site and clicking on "View pdfs of the following articles: What Frances Alenikoff Isn't Telling, Part 1" and "What Frances Alenikoff Isn't Telling, Part 2." For years Alenikoff wrote for Dance News and Craft Horizons—from a dance artist’s point of view. Her writings were also published in Dance Scope, Ear Magazine, and Movement Research Performance Journal. Her art works comprise various media, including paintings on stones and drawings on shower curtains. Her drawings, which are funny and earthy, illustrate the book Reflections on Loving and Relationships by Richard Kostelanetz, which was published last month by Archae Editions. She also designed stage sets and choreographed for independent films. Alenikoff, who danced in public into her 80s, performing her solo Re-Membering in 1998. Photo by Beryl Bernay, Courtesy Francesca Rheannon. Personally I can say that Frances was a joy to work with, as her imagination kept tumbling out, and she praised her dancers lavishly. Even better, she would tell her wild adventures and discuss life’s big issues with words of wisdom and hearty laughter. She knew how to take pleasure in the absurdities of life. She will be remembered for her flowing creativity, her larger-than-life gusto, and her generosity. Click here for a clip from a documentary that shows both her drawings and her choreographic process.